Long before clean label, gluten-free and low-carb, nutritionists were touting the virtues of whole grains. And based on years of studies and surveys, whole grains — a source of carbohydrates, multiple nutrients and dietary fiber — have proven themselves to be anything but a passing fad. According to just-released research from the Boston-based Whole Grains Council, two out of three people say at least half of the grains they eat are whole. And among those consumers who nearly always choose whole grain foods, four out of five say they’ve increased their consumption from five years ago. In addition, according to a recent International Food Information Council Foundation study, 80% of consumers recognize whole grains to be healthy. An earlier report from the same group found that 67 percent of Americans think whole grains are the most important item they look for on packages and 70 percent are trying to consume more of them. Ashley Robertson, market manager – bakery for Lenexa, Kan.-based Corbion, said industry and consumer views on healthfulness are changing — and whole grains are a major beneficiary. Corbion’s whole grains product portfolio includes everything from grain bases to organic oat blends to flaxseed mixes. These solutions, Robertson said, help bakers create whole grain products. “We’re always working to stay ahead of the latest trends and consumer demands, so we continually update our portfolios to ensure we’re delivering the best solutions for our customers,” she said. Another reason for the continued growth of whole grains, Sluyter said, is their increased popularity among foodservice industry tastemakers. Ancient grains, a type of whole grain, have been named a hot trend by U.S. chefs year after in the National Restaurant Association’s annual Culinary Forecast. In 2018, the category ranked 20th out of more than 100 trends. The nation’s top bakers are also among those leading the whole grains charge. Joanne Chang, winner of the 2016 James Beard Award for Outstanding Baker and co-owner of Boston-based Flour Bakery + Cafe, recently launched WHOLEflour, a major commitment to using whole grains. The WHOLEflour product line includes cookies, brownies, scones, croissants and more. Millers are also playing a big role, with many top firms ramping up their production of whole-grain barley and millet because of their distinctive health and flavor benefits. The proof of whole grains’ popularity lies in more than studies, surveys and anecdotal evidence. Over the past four years, Sluyter said, the number of products registered to use the council’s Whole Grain Stamp has risen by more than 30%. There are now more than 12,500 products with the stamp worldwide. Snack foods is now the fastest-growing non-bread category when it comes to whole grains, Sluyter says — thanks, in large part, to millennials. “We’ve seen manufacturers getting more and more creative with their inclusion of whole grain ingredients in products such as granola bars, multigrain chips, puffed and extruded snacks and even beverages,” she said. Gluten-free is another trend that has fed demand for whole grains, given that many ancient grains don’t contain gluten, Sluyter said. According to proprietary Corbion research, more than one-third of consumers have a “strong purchase intent” for ancient grains. 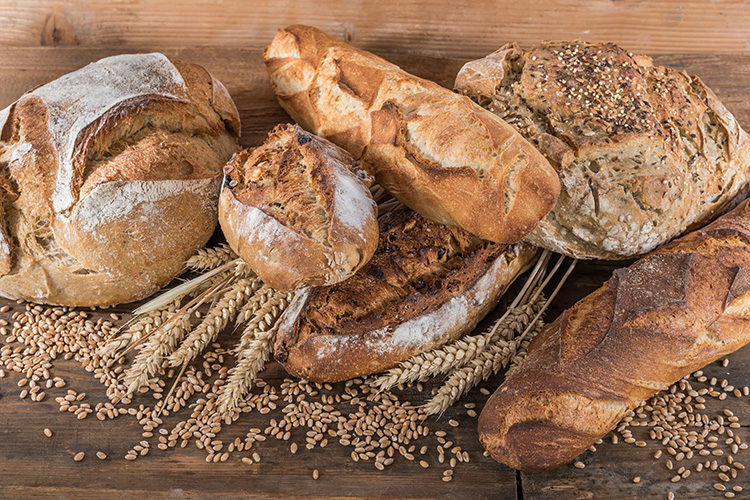 By adding ancient grains to whole grain product formulations, Robertson said, bakers have been able to reenergize the bread category and entice consumers. “Ancient grains applications are often sought after because they fit consumer demands for healthful products and their interest in experimenting with unfamiliar ingredients,” she said. Despite the long, steady growth in consumers’ acceptance of whole grains, some hurdles remain — many of them related to a gap in people’s knowledge of the category. A 2017 survey by Cereal Partners Worldwide found that while 82% of those polled said they think it’s important to eat whole grains, an even higher percentage — 83% — said they didn’t know how many grams of whole grains they should eat daily. The health benefits of whole grains are also not fully understood. While 65% accurately said whole grains can be high in fiber and 64% said whole grains can be good for digestion, just 48% said they’re good for the heart and 18% said they reduce the risk of type 2 diabetes. Bakery manufacturers, she said, can take steps to help consumers make more informed decisions about whole grains — easy-to-read ingredient labels is one obvious option. There’s always room for more education and information, Sluyter said. A key part of the mission of the Whole Grains Council is to act as an educational resource for consumers and manufacturers alike. The absence of clear labeling was something the council identified early on as a barrier for consumers who were looking for products with whole grains at their grocery store. That led to the development of the Whole Grain Stamp. “We believe that clear labeling and clear communication of the scientific research go a long way toward closing that gap,” she said. Changing behavior, she added, also often comes back to the No. 1 consumer food priority: taste. For that, chefs and food manufacturers need to lead the way. Fortunately, Sluyter said, more and more are. In general, you can substitute up to 50% of the all-purpose flour in a recipe with whole wheat flour without making any other adjustments. Whole grains absorb more moisture, so add two additional teaspoons of liquid per cup of whole wheat flour. For bread dough, allow the dough to rest for 20-25 minutes before kneading. White whole wheat gives you all the benefits of a whole grain, but with a paler color than most other whole grain flours, and with a slightly milder flavor as well.